Konyaks - The tattooed Headhunters of Nagaland ~ The Wandering Soul's Wander Tales..
On a bright Sunday afternoon, I was standing on a hilltop - one foot in India and the other in Myanmar. With neither a passport nor a visa in hand, there I was straddling across an international border [another thing off the 30 before 30 list]. In front of me, were the mountains of Myanmar covered in a dense blanket of lush greenery. To my left, located on a ridge below was the traditional Naga village of Longwa in India. The mountain air was fresh and knew no borders, but at that moment, I did. 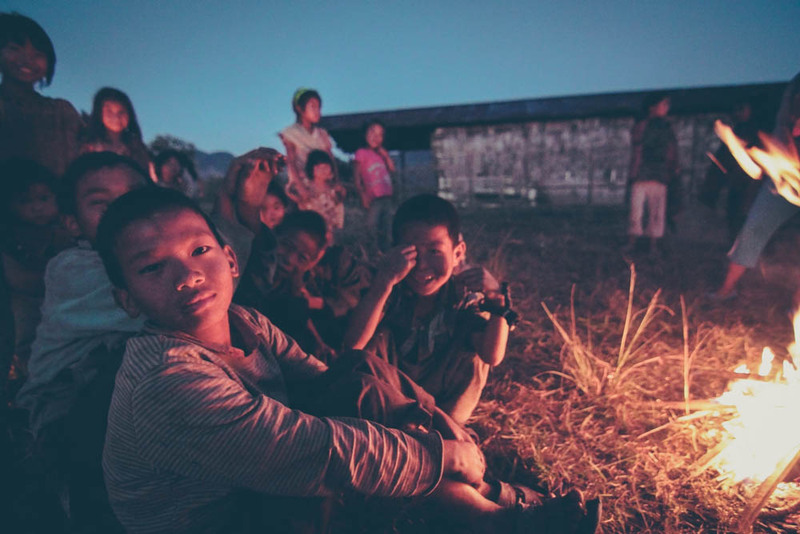 Two days ago, there was nothing remarkable about the jam-packed, rickety and dirty bus journey along the broken mountain roads from a little border town in Assam called Sonari to Mon town in north Nagaland. But it was only until an old man climbed into the bus and sat next to the driver facing the crowd. Instantly I knew he had killed at least one man. How did I know that? Because of the dark tattoo on his face and the necklace with brass faces adorning his chest. He wore colorful beaded ornaments around his neck. His ears were pierced with long animal horns jutting out. He wore a headgear that was decorated with wild boar’s teeth! Never in my life had I seen so many vestiges of slaughter on one person. He was a Konyak Naga Headhunter. Konyaks are the largest of the 16 tribes inhabiting Nagaland. Located in the mountainous regions of northeast, they are spread across Nagaland and Arunachal in India and Myanmar. They come with a history of brutal headhunting and animistic culture. Severing heads was a common practice amongst Konyaks until as recently as 1940s with the last reported head hunting in 1970s. Capturing an enemy’s head was the rite of passage for boys to turn into men, capturing the head symbolically represented capturing the enemy’s spirit. Only a person who had successfully hunted a head was given the prestigious facial tattoo. A day after I reached Mon town, I headed to Longwa, one of the bigger and traditional Konyak villages. The first glimpse of the village made quite an impression. Sitting atop a ridge of a far ahead mountain, Longwa commands a grand view of the valleys and mountains around. Naga villages were strategically built upon hilltops and ridges so that they could monitor enemy activity and impending raids. Konyaks were known to be the fiercest of headhunters and raids between villages were quite common. Neighboring villages were raided to command authority and acquire land. Konyaks are still ruled by hereditary chieftains known as Anghs. When we arrive at Longwa, as per the tradition we first visited the Angh as soon as we reached. I could recognize the Angh by the turquoise blue beads he wore below the knees. A necklace with brass faces was hanging around his neck, however he wasn’t a headhunter. He had inherited the position and the necklace from his father, who was a headhunter. The practice of polygamy is prevalent among the Anghs and chief here had several children from many wives. Hanging out with the children as they warmed themselves around a bonfire in the vast church ground was a surreal experience! The fire quickly died down as the darkness descended upon us bringing a deep chill along with it, the stars came out and filled the sky. I walked down the road that goes through the village. In the darkness, one of the Chief’s son pointed towards the mountains in front of me and said that is Burma and hidden inside those forests is the Burmese check post. I chuckled, wondering if I had to take his words with a pinch of salt. Earlier that evening, I was told the house of the Angh is longitudinally split between the two countries and that the international border actually cuts across the house and the village! The joke around here is that the Angh dines in India and sleeps in Myanmar. I wasn't very convinced of the border story. House of the Village Chief "Angh", it lies half in India and half in Myanmar. The international borders cuts across the house longitudinally! Later that night, we huddled ourselves around the kitchen fire inside Wanlem’s traditional bamboo house, accompanied by her family. Wanlem was my host in Longwa, a young Konyak lady who is the caretaker of the rest house. Accompanying me was Aching, a young college boy from Mon acting as my translator. Very few people speak English and even fewer speak Hindi in the remote parts of Nagaland. Nagamese is the script-less language spoken predominantly in Nagaland, which is a mix of Hindi and Assamese. While Wanlem and Aching conversed and I couldn’t follow their conversation, I took to admiring the bamboo structure. I couldn’t get over the fact that these houses were so vast. Every house was decorated with hordes of skeletons of hunted animals and birds. Skulls of Mithun, a bovine species found only in certain parts of North East adorning the walls and was a prized possession along with hornbill beaks and feathers. The next morning I woke up with a huge spider next to me in the rundown rest house but I couldn’t care less when I was waking up to views of cloud filled valleys, green mountain ridges and witnessing one of the most fascinating indigenous cultures! It was a Sunday morning and many of the villagers were heading to the church. Every Naga village today has a church. The Naga people were animists to begin with but after the arrival of Christian missionaries, almost all of them have adopted the new religion save for very few, like Wanlem. When I asked her if she would go too, she nodded vehemently saying she doesn’t like the church. The slow process of converting the animist tribe to Christianity started somewhere in the early 1900s. Today most of the Nagas have converted, left their headhunting ways and are staunch followers of Christianity. Every village has a church, like this. Wanlem had something planned for us for the afternoon, she wouldn’t tell us what. Aching, one of the Angh’s son and myself, three of us followed Wanlem diligently as she navigated through the mountain trails around the village. We left behind the village houses and kept going higher. Apprehensive, I asked Aching if he knew where we were headed. He didn't. Finally, we arrived at a small patch of land with brilliant views of the mountains of Myanmar and India. At the center of the open patch was a small concrete structure, the border pillar! Carved into the structure, was written “BP 154, 1970-71”, one side in Hindi and the other side in Burmese language. It was true, the international border did cut across the village and the Angh’s house! Fascinating as it was to me, it didn’t matter much to the Konyaks though. They woke up one day in 1970 to the news of the demarcation but how do you split an age-old community suddenly between two countries? They are free to move within the two countries to visit other Konyaks villages. A Konyak woman inside a typical Konyak house, they are vast airy and the kitchens have a hearth in the center which keeps the house warm during cold nights. We spent all our time around the hearth while I was there. On our way back from the border pillar to the village, we came across Pangshong, a 76 year old former headhunter waiting by the roadside. His face was covered in a beautiful dark tattoo that seemed to be fading with every passing day. Later I find out he had claimed seven lives, today the older generation has resorted to smoking opium, chewing betel nut and reveling in the glory of the former days. These people are the last generation of headhunters who had severed heads before the barbaric practice was banned. These old men will take to grave with them, the traditions, stories and the famed tattoos! To put it in simple terms, it would be the end of an era - of brave warriors, rich culture and violent times. Pangshong, a former headhunter - took seven heads! Only those who have successfully hunted a head would receive the prestigious facial tattoo. His was the last generation of headhunters before the practice was banned. He is 76 years old. These men are old, vanishing fast and will take to grave stories of headhunting. But the Konyaks have made a rather long and remarkable journey - from living in times of inter village feuds to a more peaceful time of friendship across borders. After flying back home, just out of curiosity I tried searching Longwa on Google Maps, what I saw brought a smile to my face – a border line cutting across the village! A different version of this story appeared in last month's National Geographic Traveller India. Not sure if you realize but you seemed to have treaded the same path that palin did during his himlayas documentary. The border passing thru Angha house was narrated by him too. Thanks for sharing. Truly off beat. Have been reading your posts for long.. commenting for the first time. I like your fluid writing and flaw-less photography, and above all, the off-beat places. Remarkable! Remarkable. Thoroughly enjoy reading your posts and viewing India through your eyes! Happy travelling! What made you take such a long break, Neelima?! But I am glad you brought something nice! It sure was, one of my toughest and most surreal experience! Outstanding article Neelima... Keep going !! Beautiful. I like the fact that the post has a story and not the usual you can stay here and you should do this. Love the fact that you try all this and bring to us stories of what we don't see in our beautiful country. Fantastic Account of your travel to Longwa. It was just like being there . Keep up the good work and keep travelling !! Nice writeup and gorgeous photographs of Longwa. One of our guest just returned yesterday from staying a few days in Longwa, having become a favorite of the Angh, having smoked and celebrated his birthday with the jolly tribe. Definitely a must visit for the offbeat traveler. Also, nice to see you have written about it in NG. Surely more people will visit this hidden village now. Wonderful experience!! I really appreciate the way you are following your heart. Excellent narration! Now I want to head there. Wow! This is one of the best travel posts I have come across and you write beautifully. Loved the pictures too. Awesome photographs!! sounds a memorable trip for you..
my new post about a world heritage site Amber Fort. Thanks Swati, yes it was a good trip. Thanks Lemwang, glad you liked the post. I will try to post more pictures soon. What fascinating stories, Neelima! Sure how to see the line for myself some day. Came across your blog by chance but I am glad as it brought memories from my last visit to Longwa. Loved the photos from your flickr page too Jim, Nagaland's surely a great place for photographers. Thanks. Came to your blog by following one link to another and then to another... and well.. here I am :) and I feel, you will be the one who can solve a couple of my queries. Actually, i have been wanting to go to Nagaland n manipur for a while now.. after I made all the train bookings to Dimapur, i realised that to enter nagaland I need an ILP which will be issued by some poeple sitting in shillong, del, kolkata and guwahati... Wanted to know how u arranged for ur ILP n how much time does it take to get one? Im here in Manipal (karnataka) and just cant get any clue how to go about this.. I found your website via the BBC. I thought you might find it interesting to know that the Konyak child in Longwa standing in front of the animal skulls is wearing a T-shirt displaying the logo of WREK, the student owned-and-operated FM radio station at the Georgia Institute of Technology in Atlanta, Georgia, USA. Atlanta is over 13,000 kilometers from Longwa. The shirt is of a style most likely from the '70s or early '80s. Another, albeit odd, example of “modern civilization” creeping into Nagaland. Excellent write up! Pic of the church is just amazing! Feels exciting! And yes, splendid snapshots! I really need your expert opinion and few queries to be answered please...how do I contact you? The Forests of Kanha - Instagrammed!